There’s the old saying, “April showers bring May flowers.” To bring May flowers requires the nourishment of the April showers. Similarly, accomplishments require the nourishment of hard work and persistence. This month, focus on learning and inspiring others to do so as well. It’s a great opportunity to learn something new or to polish an existing skill. Maria Keller is committed to helping other people gain access to reading after being an avid reader herself. Currently, she’s collected over 2 million books for her organization Read Indeed, and she is continuing to expand and improve Read Indeed. The books are donated to classrooms, charities, and individuals around the world, impacting thousands of young readers along the way. Read on to learn more about Maria and her organization! Maria has been reading since she was a young girl, and when she was eight, she was shocked after a conversation with her mom that not all kids are able to have access to books, even kids in her local community. This led to Maria organizing a book drive in her school when she was only eight years old. After the book drive concluded, Maria set an ambitious goal for herself: to collect 1 million books for those in need. And at just 13, Maria was able to achieve her goal. For Read Indeed, the hardest part was not collecting the books themselves but rather organizing Read Indeed to maximize their impact. Maria says, “People were impressed with my mission and so willing to support it already.” The power of her community had strengthened Read Indeed’s efforts. At the heart of it, Read Indeed is a bridge between the donor and the recipient. They collect from donors, sort the books, and give them to people like teachers. In turn, the teachers inspire kids to start reading. Maria is inspired to continue Read Indeed based on the positive feedback she has gotten from students who have been given books by Read Indeed. She recalls a particular story where a parent emailed his son’s teacher in Spanish, saying how happy he was now that his son could start a bookshelf collection thanks to the books his son had received. With around 30 to 60 other teachers also receiving books from Read Indeed, there is bound to be many other children who are now able to be opened up to the world of reading. 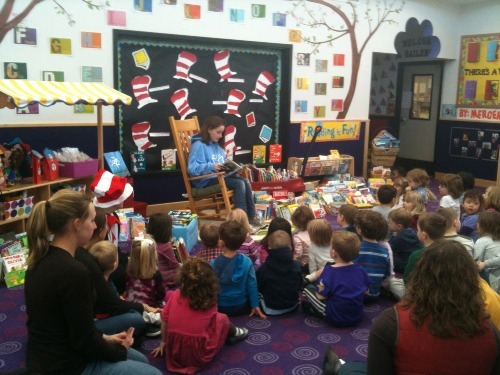 Maria reads to a group of students. When Maria is not helping others read, she’s reading herself. Maria’s recent favorites include Jane Eyre by Charlotte Bronte. She says, “The recurring theme of moderation in Jane’s moral and ethical decisions was most impactful to me…she continues to reject any attempts to coerce her to give up her principles and her freedom.” Maria also cites Jane Eyre as being “ahead of her time” and standing up for women’s rights and freedoms. In The Book Thief by Markus Zusak, there is a similar theme. Main character Liesel fights Hitler’s regime by reading books that the Nazis want to be destroyed. After she graduates high school this year, Maria is interested in attending top colleges including Nortre Dame, Yale University, and Princeton University. She will continue to spread Read Indeed’s impact, though: Maria says she plans on starting another Read Indeed chapter at the college she ends up choosing and will work on making Read Indeed chapters common in colleges nationwide. When she’s not curled up with a good book or working to further better Read Indeed, Maria enjoys spending time with friends and family and playing with her golden retriever. Her hobbies include baking and playing with board games. This month, focus on learning the thing you’ve always thought about doing. Explore a new hobby; take up a new sport. Take the first step in pursuing your passions. To bring May flowers, you first have to create April showers. Good luck on your journey! You can support Maria and Read Indeed by donating books or funds to support kids in need. Maria is also looking for volunteers to start Read Indeed chapters in their own communities, and she has a Youth Advisory Council comprised of teens and tweens that encourages kids to read.